Top-10 companies held 39% of the worldwide O-S-D market in 2018, the same level as in 2017. IC Insights’ new 2019 O-S-D Report—A Market Analysis and Forecast for Optoelectronics, Sensors/Actuators, and Discretes was released at the end of March. Among the O-S-D industry data included in the new 350-page report is an analysis of the top-30 O-S-D suppliers (the top-10 ranking is discussed in this Research Bulletin). Companies selling optoelectronics currently dominate the ranking of the top-10 O-S-D suppliers. Figure 1 shows that nine of the top-10 companies sell optoelectronics, while six offer sensor/actuator semiconductors, and five provide discrete products. Only four of the top-10 companies sell products in all three O-S-D market segments. 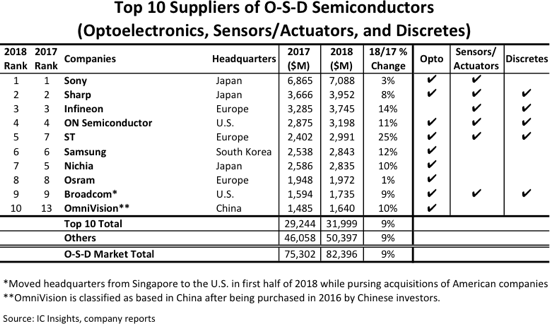 The 10 largest suppliers in the ranking accounted for 39% of combined worldwide O-S-D revenues in 2018, which is the same percentage as in 2017 (in contrast, the top-10 IC suppliers held a 70% share of the total IC market in 2018). On a regional basis, three of the top-10 suppliers are headquartered in Japan, three in Europe, two in the U.S., and two in the Asia-Pacific region (one in South Korea and one in China). It is worth noting that Japan’s strong historical position in optoelectronics and discretes continues to keep three of the largest Japanese semiconductor makers in the top-10 O-S-D ranking despite ongoing economic weakness in the country. Many Japanese suppliers have phased out commodity discretes and now outsource product production because of cost pressures. Moreover, a number of Japanese companies have also increased efforts in CMOS image sensors as well as in fast-growing sensor/actuator devices. Three companies changed position in the 2018 top-10 rankings compared to 2017. Two moved up in the ranking (ST and OmniVision), while one company moved down (Nichia). There was one new entry in the top-10 list in 2018—CMOS image sensor supplier OmniVision, which saw its sales grow 10% last year to about $1.6 billion. Operationally located in Silicon Valley, fabless OmniVision—which was acquired by a group of Chinese investors in 2016—was 13th in the O-S-D ranking in 2017 and remains the third largest supplier of CMOS image sensors in the world. Falling out of the top-10 O-S-D ranking in 2018 was Japan-based optoelectronic and discretes supplier Renesas. The company fell from 10th place in 2017 to the 12th position in 2018 as its O-S-D sales increased by only 1% last year. The top four O-S-D suppliers in 2018 held the same positions as they did in 2017. Optoelectronics giant Sony in Japan—the largest supplier of CMOS image sensors—easily maintained its number one position in the O-S-D ranking with sales totaling nearly $7.1 billion in 2018, which was $3.1 billion more than second-ranked Sharp in Japan. After a strong 19% increase in 2017, Sony’s O-S-D sales growth slowed to only 3% in 2018 because of weak demand for CMOS image sensors in the maturing smartphone market and falling unit shipments of laser pick-up devices for optical-storage disc drives. In total, six of the top-10 O-S-D suppliers registered double-digit percentage sales increases in 2018, with ST leading the way with a 25% jump in its O-S-D revenues last year. About half of ST’s increase in O-S-D sales was generated by discrete semiconductors, which grew 27% to $1.3 billion in 2018 partly because of higher selling prices for power transistors, power diodes, and other parts that were in short supply in the marketplace during the year. The other half of ST’s O-S-D sales increase came from optoelectronics revenues, which surged 48% to $903 million for image and light sensors. During the last half of this decade, more Chinese companies are expected to climb into the top ranking positions for optoelectronics and discrete products. However, acquisitions and mergers among large established O-S-D suppliers may delay that from happening for a few years. A number of startups and specialized suppliers in the U.S. and in Asia continue to see strong growth rates in MEMS-based sensors and actuator products.